Saturday 23rd November. Gertie's floppy one! The recent weekend away at the NEC highlighted an issue with Gertie's indicator stalk. Something had obviously gone wrong somewhere and although it was still working it had become very loose and floppy like. Luckily Dave Harvey was attending the NEC and after a quick phone call, he grabbed some spares he had laying around and brought them with him. Resisting the urge to try and fix it at the show, I waited until the following weekend before pulling the car to bits. I decided the easiest way was to remove the dashboard binnacle, all of the gauges and various switches. With the mechanism for the indicator stalk removed the problem became obvious. The barrel that the actual stalk fits into had broken in half and was allowing the stalk to move excessively. Luckily Dave has supplied one of these too, so this and the new stalk were fitted and the interior refitted. With it all reassembled the indicator was tested and I'm pleased to say it was all nice and tight and working as Triumph originally intended. Whilst in the garage I decided to fit a new sticker to the front wings. I'd seen it at the NEC and it appealed to my warped sense of humour, so I had just had to have it. With this done it was time to turn my attention to my recently acquired Mini. Driving home from work in the dark with the lights, heater and wipers on was making the fan belt slip and subsequently squeal like a stuck pig. I don't think the alternator has got long left to be honest as the charging light comes on on tick over when all these items are running. However, because the fan belt was slipping this could also have been the reason for the alternator not charging properly. A new fan belt was obtained and the task of trying to figure out how to fit it began. The fan is incredibly close to the radiator and the radiator mounting plate is also very close to the crankshaft pulley. After trying to get the fan belt past both of these unsuccessfully I decided to undo all of the radiator mounts and cowling so I could move the radiator back and have more room. Luckily this worked. Recent test drives have shown that the squealing has stopped but the charging light is still coming on. Looks like a new alternator could be on the shopping list then! Wednesday 30th October. Gertie goes modern! A rush home from work saw me in the garage at 17.35 and awaiting the arrival of Colin Wake. (Scrapman on the CT forum) The reason for Colin's visit was to assist in the fitting and tuning of my 1-2-3 Performance and programmable distributor. Colin is a bit of a whizz in anything IT and tuning and advance curves and all manner of stuff that I don't really understand. So the plan was to fit the new dizzy and then take the car to the CT Essex meet and have a play while on route. With the dizzy fitted we then attempted to start the car and to our surprise it fired and ran straight away. So with the USB lead connected between the dizzy and the laptop via the bonnet and the quarter light window, we set off for the meet. Saturday 26th October. Something different! With the car hunting I still wanted something old(ish) but something that I can use every day, has good fuel consumption and I can also do other events in. Spares and parts availability needs to be good too so that if it does go off the road for any reason it can be repaired and put back into use pretty quickly. 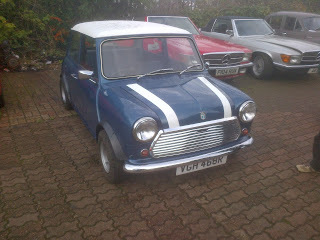 After looking around at a few different options I decided the ideal car would be..........a Mini! 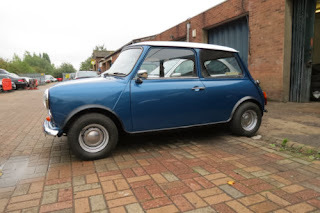 A proper little Mini that is. Not the stupidly large German 'Mini'. They have a great following, plenty of regional and local clubs and events and there's very little you can't buy for them. So after looking at a number of them and weeding out the rot boxes a choice was made on a 1977 Metallic blue 850. Ideally I did want a 998cc model, but this car has a stage one tuning kit, Cooper front disc brakes, Koni shocks all round, but more importantly a very, very good solid shell. Anyone into Mini's will tell you it's better to have a good shell with the wrong engine, than the right engine with a crap shell. It also has high lift rockers fitted, but there's no history with the car and the camshaft spec is unknown. I'm hoping it has an upgraded camshaft and that's why the high lift rockers were fitted, but who knows? It certainly flies along for an 850! So, after some serious haggling, said Mini was collected and driven home from Chadwell Heath near Dagenham and I'm pleased to say it did so with no issues at all. It does appear that the stage one kit has been fitted, but then the carb hasn't been fine tuned to suit the new needle, so a rolling road session at Atspeed in Rayleigh is booked for Friday morning where this issue will be addressed. Saturday October 5th. The estate gets a Rat look! For some weeks now the bonnet on my Mk2 estate has needed attention. I haven't been able to open or close it without it catching on the front panel and causing damage to the paint. After several previous attempts at adjusting it, all to no avail, I had come to be convinced that the bonnet was rusting from the inside of where the bonnet hinge plates are welded on. Or.....if I'm going to paint the bonnet black shall I go the whole hog and create what I had before? A Mk2 estate in the guise of a British Leyland Rally Support vehicle. I always loved the look of that car and regretted selling it. (Although it was rotten!) This is the car on the 2009 HCR. It was my first Club Triumph event. We managed to earn joint fourth place and our results have got progressively worse on this event ever since! Another issue I had always had with this car was its reluctance to wear a strut brace. For some reason with a strut brace fitted you could never close the bonnet. I think its had either accident damage or restoration repairs at some point in the past and the front panels were never lined up properly. Seeing as Gavin was present and is a dab hand on the gas welding kit, he cut into the strengthening framework under the bonnet and altered and re-welded them so that they could compensate the strut brace. So for the first time since I've owned the car (Five years this New Year) it now has a strut brace. Sunday September 22nd. More welding! With Gertie now finally back on her wheels again I was able to bring her out of the garage and strip the interior out so I could get to the floor by the handbrake. Luckily it was a dry day with no sign of rain, so pretty soon all the seats and carpet etc had been removed to allow access to the floor. Once the carpet was removed it appeared that the cracked floor was far worse than I first thought. (Isn't it always?) I have to admit though, the handbrake lever had never felt loose, this was just something I had spotted from underneath when removing the propshaft. It also made me wonder how many other big saloons are driving round with the same issue without realising it. After this I had to remove the exhaust I had fitted the day before so I could refit the propshaft, then I reattached both of the handbrake cable and then the exhaust. again. September 21st- Gertie is back on her feet. With the welding finally completed on Gertie's rear floor it was time to start the reassembly. There is some more welding to do, but it’s near the handbrake mounting so I need to remove the seats and carpet and I can only do that with the car outside the garage. So today's task was to get it back on it’s wheels and rolling at least. The first (and trickiest) job was to refit the differential. This is normally straight forward with two people but today I was working alone. Plus the car was jacked up at an insane height, so lifting it was going to take some doing. After the third attempt and several swear words the diff was bolted up on the pins with a large truck axle stand supporting the nose cone. The diff has been fitted with a new quill shaft bearing and new seal and has also been reinforced while it was out. Next to be fitted was the nearside subframe complete with a new superflex suspension bush. The trailing arm was next followed by the spring, brake back plate and the driveshaft. With the nearside completed I then reassembled all of the offside. The next job was to refit the fuel tank which was a bit awkward to get to the breather pipes and the filler pipe. However, after removing the vinyl parcel shelf tray, this became a lot easier due to having more access. While the car was still up in the air I filled the diff with new oil and also refitted the exhaust. Fitting the exhaust was a mistake actually as I then realised that I should have fitted the propshaft first due to clearance and I cant fit the propshaft until I’ve welded the floor and refitted the handbrake. So it will have to come off again. By close of play though everything was refitted and Gertie was standing on her own feet (Or wheels) again, so it was quite a successful day. My Club Triumph 10 Countries Rally began on a very foggy A127 driving down to Darren Sharps house to load my gear into his car for this epic adventure. After a quick cuppa we took a leisurely drive down to Dover docks via Tesco’s for a cheap breakfast and refuel. Seeing as it was a nice afternoon, we sat in a roadside bar and studied the map and tried to learn the route that we would be taking over the next five days or so. It looked an interesting route and we were both looking forward to driving around Monaco and Nice. Later in the evening with met up with Tony Pullis and Zak (Whose Mother-in-law had predicted would die in this trip! Nice!) and had a fantastic Pizza and some beers. Later in the evening we also met up with Team Torpedo. A group of guys that had flown over from America and bought four cars in England to take part in this event. Very Impressive! After a good few beers with these guys it also turned out they were also staying at cell block H with us. They also had a large bottle of Monkey Shoulder Whiskey which they insisted had to be finished before we could retire to our rooms. The following morning we headed down to the official start where we met with the 70 or so other crews taking part. After listening to the final instructions we set off heading for Belgium, but at the first junction we came across the four cars of Team Torpedo all stopped in the hard shoulder. We asked if they needed help to which one of them replied ‘No, we’re ok. We’ve just left one of our guys at the start’. Still laughing we headed for the motorway which turned out to be our first mistake. Some forty minutes later we hadn’t got very far due to roadworks and traffic jams. We then made our second mistake when we decided to turn off and cut across country roads but found some of those closed due to roadworks too! By the time we arrived at the first check point at the old Reims race track we were an hour late. It wasn’t too bad though, as there were quite a few other crews there too. After a quick photo session we cracked on towards the next control at Dijon race track and after some spirited driving we arrived there on time, so we had caught up the hour we had lost on the diversion. Shortly before arriving at Dijon we had been hearing a metal scraping noise coming from the underneath of the car, but a quick check of all exhaust brackets revealed nothing untoward. However, just as Darren was about to close the bonnet I noticed that the battery was sitting really close to the alternator. Then I noticed that the battery clamp was missing. Closer inspection showed that the clamp had fallen off completely and was balanced over the front beam but dragging along the floor. That’ll be the metal scraping noise we heard then! With it getting dark we decided to miss the national roads and take the motorway down to Grenoble with the hope of gaining a few extra hours sleep on the overnight drive. This was a good plan and we arrived at the Bastille at Midnight. We took a quick pic as our proof that we’d been there and then decided to miss the sleep stop and get out of Grenoble city before the morning rush hour. It was quite an entertaining drive out of the city with many bus stops and corners frequented by young black girls with very little clothing offering their services. Although it was late, I still wasn’t tired and we decided to just keep going until we did. The night drive was made more challenging by the full beam switch burning out, (That’ll teach Darren not to fit relays!) but we coped well and before we knew it we had arrived at Friday morning’s control point at the abandoned village at around four in the morning. Five hours early! The abandoned village is also close to the Col de la Bonnet which is the highest mountain in Europe at 2,802 metres high. Needless to say the stars looked amazing and the place was deathly quiet. We got our heads down and slept well for about two and a half hours, although we were bloody freezing when we woke up! Newly refreshed we set out towards Nice and had the pleasure of driving through the city in Friday morning rush hour. We took the coast road towards Monaco where I took over the driving so Darren could hang out of the sunroof and take pics of parts of the grand Prix circuit. After more traffic we eventually turned north bound and back over the mountains where we managed to find a nice little French café for some lunch. Another leisurely drive up into Italy saw us arrive at our hotel in Italy at about 3pm. I caught up on some much needed sleep after my night driving session while Darren went and ‘socialised’ in the bar. By evening time most of the other crews had arrived and it was a real good night despite the hotel running out of beer! Dinner was an experience best forgotten too to be honest. Saturday morning dawned beautiful and hot again and the nights entertainment had obviously taken its toll on me as I managed to take three wrong turns including taking the wrong slip road on a motorway and having to go ten miles to turn round! We continued to head northwards and soon made the first control point at Lake Maggiore. What a beautiful place this is. I can see why people holiday here. Switzerland was the next country on the list and the next (and final) check point for the day was San Bernadino. After a coffee and some fruit (I wouldn't pay £8 for a sandwich!) we headed off again before diverting through Lichtenstein and Austria. After a few more stops for some pics we headed for Lake Constance where, based on the previous nights disappointing dinner we decided to eat before arriving at our hotel. Luckily we found a road side Pizza bar that served very good food. We arrived at the German hotel around 7pm and after a wash and brush up we wandered down the town to the pub where we met up with lots of other crews. After the pub closed we headed back to the Hotel to find that Team Torpedo had just arrived after suffering a breakdown with EVERY car that day. They looked tired, deflated and dejected. So we stayed in the bar with them until 3.30am purely for supportive purposes you understand! Sunday morning saw a grey and gloomy drive up through Germany, back into France and then up to Luxembourg. The rain stayed away though and after completing numerous check points we arrived at the race track at Spa in Belgium. After more pics we then set off for the final check point at Rolduc in The Netherlands. This is always the final location and where the party really starts as the three previous nights are just rehearsals. Team Torpedo were among the last to arrive again although they had had a good day compared to Saturday breakdown wise. Needless to say, a huge cheer went up when they did arrive as their determination and dedication was a joy to behold. Well done guys. A splendid achievement. I had a somewhat early start on the Monday as Darren and I had a twin room in the dormitory and due to copious amounts of alcohol consumed he was snoring like a warthog with asthma! I had had enough by 5am and went and slept in the car. I awoke at 7am and headed in for breakfast but as I walked away from the car realised I had locked the keys in it! Bugger! Never mind, it’s a Triumph. Anything will break into it. A Triumph stag key got it unlocked quite easily actually. With Darren still suffering I did the drive to Calais where we were hoping the boats wasn’t delayed by strong winds like they were two years ago on the same event. Luckily there weren’t and we back in Blighty by about 3pm. Lashing rain and cold weather greeted us and the alternator decided to pack up as well. It didn’t affect us though, we had enough battery power to reach Darren’s place. So, it's now back to the reality of work, rain, and boring every day stuff. However, there's also the possibility of another short European trip in November providing I can get Gertie ready and find a navigator. Here's some more pics for the event. Saturday 31st August. not much done but lots of visitors! Well today was the day I had been dreading. The only way to replace the seriously worn diff pin was to cut into the box section under the fuel tank, then grind the head of the pin off and then also cut the weld also holding the pin from underneath the car too. I had to break off at lunch time to go and collect the buyer of the Red Shed. I know this will come as a shock after all of the hard work I've done on the car, but I'm also looking to move house soon too and finding somewhere to garage three cars would be very unlikely, so one had to go. Gertie is without doubt my favourite with the estate a close second, so the red car it was on the for sale list. 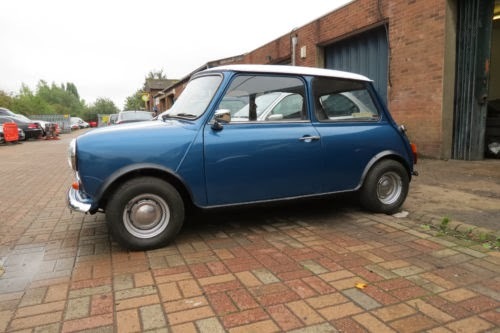 The new buyer was very happy with her (I'll let him reveal his identity if he wants to) and while he was there Lee Godfrey and Dave Harvey called in for a cuppa as they were also in the area looking at a MK2 saloon. Gavin arrived shortly after and started helping me remove the diff pin. The bit I hated was having to cut into the rear box section to access the pin. This will have to be welded up again when the new pin is fitted. With this done we then had to try and get into the above hole with a grinder to try and cut the two welds holding the head of the pin onto the metal work. This was easier said than done but we eventually broke it free. We then cut the pin off from underneath and then ground the metal back until the weld had disappeared. We were then able to punch what was left of the pin out of the hole. Once the pin was removed it was quite alarming how much of it had worn away. It also made me wonder how many other big saloons are driving round in this condition without the owners realising it. The new pin is now sitting in place but proper fitment will have to wait until a new gun for my welder arrives. I also have the 10CR to contend with shortly, so I doubt much will be done now until I return. Bank Holiday Weekend 24-25-26th August. Driving the red car home on Thursday evening I became aware of her running sick and a distinct smell of petrol whenever I stopped. With petrol being the ridiculous price that it is immediate investigation was required. It turned out that the rear carb was leaking. I removed the carb and then the float chamber. For some reason the floats had become detached on one side and was leaving the needle valve open. What I discovered was that if the pin for the floats is put into the holder the wrong way round, there is room for it to slide out and release the floats into the chamber. By turning it round this prevented this happening. So this should have been an easy fix. However, during the reassembly I must have managed to break one of the lugs that the pin slots into somehow. Bugger! A quick phone call to Colin Wake had him searching in his spares and as a result a trip to North Essex/Suffolk land on Friday night saw me collecting a spare carb body and a decent, although somewhat multi-coloured bonnet for my estate. Saturday morning saw me strip my existing carb of spindles, springs and all other tiny pieces and refit them onto the new carb body. After reassembly I was surprised to see that the Red beast started up with no issues. I hadn't lost any parts or fitted anything wrongly! Blimey! The rest of Saturday afternoon was spent trying to stop my garden and garage from flooding from the torrential rain we were getting after getting saturated I called it a day and went indoors without even taking the red car for a test drive. A bit of a quiet day on the car work front today as I had been offered a place on the Club stand at the classic car show at Knebworth. I had planned to run down with Darren Sharp in his MK2, but me being very late and lot leaving Wickford until ten past nine I ended up going there alone. A good run down the M25 (all at legal speeds officer!) with no traffic and I was on the show field by 10am. The day started off very grey but by afternoon the sun had made an appearance and it turned into quite a lovely day. It was a nice day out but I made tracks about 4pm as I still had to get home and prepare Gertie for some welding work the next day. James Cooper came up today to do the welding on Gertie for me. Things were going well until my welder packed up, but luckily Davemate very kindly brought his one up for us to borrow. Once this arrived the job didn't take long, but we discovered a real horror while underneath. One of the differential pins has worn away to half its original width. These pins are buried inside the rear crossmember, so the only way to do them properly is to cut a large hole in the subframe to gain access, cut the old one out, and weld a new one in. It also means draining and removing the fuel tank. (Which I did this afternoon) More work that I really don't have time, or money at present to do. Looks like Gertie will have to sit on the back burner for a while until funds allow. A few jobs on the list this weekend so no time was wasted getting stuck in once I’d finished my chores Saturday lunchtime. First job on the agenda was to reinforce the differential casing in readiness of Gertie’s return to the road. I had cut and shaped some pieces of metal during the week, so they were already to be welded in place. I encountered a bit of a problem in that despite my gas bottle showing half full on the gauge it was in fact empty! This was particularly annoying as my gas supplier (Allied Welding Supplies in Benfleet) were now closed. I had already been over there in the morning buying some wire brush attachments, so I could have exchanged it then if I had known. Luckily Gavin had called in and offered to go home and get his arc welder to do the job. With this done the job was soon completed and I no longer have to worry about Gertie’s torque bending the diff casing. While Gavin was welding I decided to have a play with my new helicoil kit. Two of the studs on the trailing arms had pulled out of the alloy and there was no thread left in them to tighten against. The kit allows you to drill out the existing hole, then re-tap it and then insert a new thread piece in which the stud can be inserted. I had never used one of these kits before and was quite impressed with how well it works. Now Gertie's trailing arms have all six studs fitted as Triumph designed them. Result! After this Gavin helped me remove the remains of the diff from the car so it will be easier to fit the new seal that’s arriving soon. It also now leaves the rear of the car completely without any rear axle so access to the part of the floor that needs welding will be easier too. While Gavin was still around we had to go at lining up the bonnet on my Mk2 estate. For some reason this now refuses to open and close without making contact with the front panel. After trying various different things we still couldn’t get it to make any difference. Close inspection of the bonnet hinges revealed that one of them has pushed itself into the bonnet due to much rustiness! Bugger! Now I’m going to have to find another Mk2 bonnet. Last job of the day was re-torque the cylinder on the Red car now that it’s got a few miles under its belt. This is a bit of a pain because with the Mk1 engine the right bank of head bolts are external, which means you have to remove the inlet and exhaust manifolds to get to them. However, what with recent head removals I’ve done on this car I’ve become a bit used to it and I had it all done in just over the hour. Saturday morning saw an early start and a drive up to Colin Wake's place in Suffolk. More parts were being collected for Gertie and Colin also showed me how to remove the bearing from the quill shaft on my differential. Although the bearing seemed fine, Colin agreed with me that there was a lot of resonance going through the casing when the shaft was in motion. Possibly caused by a bent quill shaft. Once home the next plan was to remove the front windscreen from the Red car and inspect the metalwork behind it. I had taken her to the drivers meet for the 10 countries rally the Monday previous in the torrential downpours. To say that she leaked was an understatement. I had never driven this car in the rain and I couldn't believe how much water was pouring in! I only needed a few rocks and some plants and I'd have had an in car water feature! When I arrived at the Plough I looked like I'd been standing in two buckets of water much to everyone's amusement. Following this I had arranged for somebody to come to my work place the following Monday to fit a new windscreen rubber, but with the leak being so bad I was worried that the metal behind the windscreen was rotten and they wouldn't be able to refit it once they had taken it out. So we took the screen out Saturday afternoon so we could cancel them if we needed to. Luckily, the metal behind the screen was like brand new so it was put back in, secured with gaffa tape and left ready for the new rubber. The first job however, was to readjust the valve clearances on the Red car. (See? I didn’t call it a shed!) Looking closely at the valves and rockers I spotted what turned out to be a broken washer. Luckily it hadn’t broken small enough to drop into one of the cam followers or anywhere else so I was relieved about that. With the tappets quickly done I refitted the rocker cover and turned my attention to Gertie. When I removed the nearside rear subframe yesterday I remembered that the exhaust bracket was broken. Mk1 subframes are becoming rare now, but I’ve managed to source a Mk2 pair with the better exhaust mounting. I then decided to remove the other side too. The subframe bolt on this side was a real pig to undo because it was seized solid and I ended up cutting the damn thing off with an angle grinder. Now that both subframes were removed I then removed the propshaft and the quill shaft. I was going to send the propshaft away to be checked for balancing. The reason for this was because the car gets a vibration that starts at 70mph and gets progressively worse. However, close inspection of the quill shaft revealed a somewhat knackered bearing. Spinning it manually showed that it doesn’t rotate freely at all. I’m quite convinced that this will be the cause of my vibration. Lets hope so. Now that Gertie is high in the air with more or less no back axle in her I need to get this welding done as I can't put it back together until it is. I also found more welding that needs doing on the handbrake mounting, but this doesn’t look too serious.